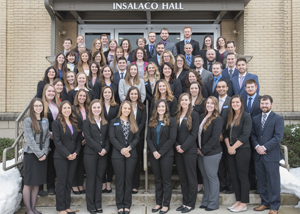 Graduate students in the Doctor of Physical Therapy Program at Misericordia University recently presented their capstone research projects at the fifth Annual Student Research Symposium: Current Research in Physical Therapy in Sandy and Marlene Insalaco Hall. The 49 student researchers presented their work before an audience of clinical instructors on subjects that focused on musculoskeletal and neuromuscular disorders. The two-day symposium provided participants with specific learning objectives on 13-student research groups that addressed topics such as lower back and girdle pain, hip range of motion, concussions, strokes, Parkinson's disease and more. It also included discussions on the subject matter. Each participant earned continuing education credits for completing the symposium. The Doctor of Physical Therapy program at Misericordia University is a 6½-year professional program in which students receive a bachelor's degree and a doctor of physical therapy degree. Undergraduate students complete the requirements for their bachelor's degree during their first 3½ years of study in programs like biology, business administration, health care management, psychology, sport management, and more. Students accepted into the Misericordia program as first-year students progress into the graduate program as long as they remain in good academic standing. Misericordia also accepts transfer students into the doctoral program. Academically qualified students with a bachelor's degree can complete the doctorate degree in three years. For more information about the doctor of physical therapy program at Misericordia University, please call (570) 674-6400 or visit www.misericordia.edu/pt. Graduate students in the Doctor of Physical Therapy Program at Misericordia University presented their capstone research projects at the fifth Annual Student Research Symposium: Current Research in Physical Therapy. Participating in the program, first row from left, are Kelsey Frasier, Clementon, N.J.; Julia Marceca, Kinnelon, N.J.; Lauren Malick, Ringtown, Pa.; Erica Moore, Staten Island, N.Y.; Samantha Partington, Fogelsville, Pa.; Meghan Stack, Douglassville, Pa.; Kara L. Pawloski, Plains, Pa.; Maureen Ciccosanti, Middletown, N.J., and Colin Snyder, Bloomsburg, Pa.; second row, Sarah Wigg, Montgomery, Pa.; Rachel Cordasco, East Brunswick, N.J.; Kayla Hope, Tamaqua, Pa.; Danica Kuti, Landing, N.J.; Lindsey Stitzer, Nazareth, Pa.; Lauren Reinert, Bath, Pa.; Trever Reed, Gaithersburg, Md., Ross Baver, Bernville, Pa.; third row, Kristina Ruby, Duryea, Pa.; Samantha Rose Keifer, Pottsville, Pa.; M. Kelcey Langan, Scranton, Pa.; Kelly Keener, Pittston, Pa.; Christina Chirico, Montague, N.J.; Gabrielle Van Mater, Wrightstown, N.J.; Tim Martin, Trout Run, Pa.; Tara Kolativa, Wilkes-Barre, Pa.; Megan Phillips, Hallstead, Pa.; Julie Bogaert, Bangor, Pa.; Katie Paisley, Hazleton, Pa.; Christopher Boroch, Milford, Pa., and Garrett Drumheller, Elverson, Pa.; fourth row, Alexandria Miller, Scott Twp., Pa.; Maureen Rineheimer, P.T., Ph.D., assistant professor; Amy Koch, Reading, Pa.; Kristen Karnish, P.T., D.Ed., M.P.H., G.C.S., assistant professor; Mariah Osgood, Middleburg, Pa.; Nina Williams, Larksville, Pa.; Amy Tremback-Ball, P.T., Ph.D., associate professor; Kelsey Williams, Taylor, Pa.; Todd Mitchell, Hughestown, Pa., and Kevin Matlon, Whippany, N.J.; fifth row, Rufus Hay, Whiting, N.J.; MariClaire Thresten, P.T., M.H.S., O.C.S., faculty advisor; Shelley Black, Hanover Twp., Pa.; Kelley Moran, P.T., Ed.D., D.P.T., A.T.C., C.S.C.S., associate professor; Nicole Rhody, Schuylkill Haven, Pa.; Laurie Brogan, P.T., D.P.T., C.E.E.A.A., G.C.S., assistant professor; Jordan Weber, Summit Hill, Pa.; Matthew Maguire, Glenmoore, Pa.; Ben Muschlitz, Northampton, Pa., and Steve Pheasant, P.T., Ph.D., professor; sixth row, Richard Haydt, P.T., D.P.T., O.C.S., M.T.C., F.A.A.O.M.P.T., associate professor; Adam Wasiakowski, Mountaintop, Pa.; Brian Delaney, Yatesville, Pa.; Anthony DeGrazia, Carbondale, Pa.; Eric Dittmeier, New Hyde Park, N.Y.; Annie Stewart, Sunbury, Pa., and Heather Fritz, P.T., D.P.T., assistant professor.